Full Fitness: Exercise Workout Trainer is a fitness app that is mainly destined for men but can also be used by women. Developed and published by Mehrdad Mehrain, this app offers hundreds of workouts that are illustrated by texts, images and videos. It can also be used as a Calorie tracker to become and stay fit. Exercises by muscle or by equipment: workouts are categorized by muscle of target or by body region. This means that exercises are different depending on these aims. Apart from that, Full Fitness: Exercise Workout Trainer also provides exercises with various materials such as Dumbbells, Barbells and other equipments. Materials: Full Fitness: Exercise Workout Trainer offers different kinds of methods to pass down workouts. Indeed, the user can directly play video demos, images or text directions that he can immediately follow. 30 Routines: there are already 30 pre-defined routines that are available on the app's database. But apart from them, users can also create their own routines and track their progress (can be displayed in graph) when doing workouts. Calorie tracker: built-in with weight monitor and BMI calculator, Full Fitness: Exercise Workout Trainer can also be used as a calorie counter. This means that the user is utterly free to view how many kilograms they need to keep fit. It also provides over 90, 000 food items. A simple Timer and a calorie counter are integrated. 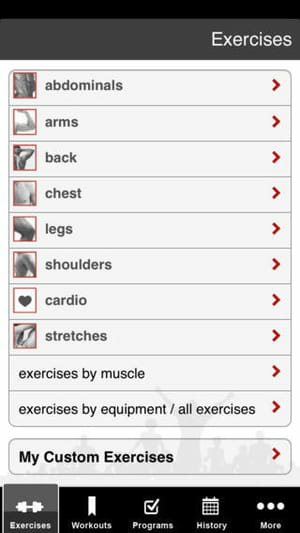 Full Fitness: Exercise Workout Trainer can be backed up on iCloud. Latest update on June 26, 2018 at 08:18 AM.